Hagan has been manufacturing performance ski mountaineering gear in Austria for over 90 years. Well known in Europe as perennial podium contenders, Hagan focuses on light and fast ski gear for long tours and races. We think their quality and value are hard to beat. Hagan has been working diligently for years on shaving weight off its race ski. Having reached practical limits, they’re now focused on making it slay the toughest of conditions. 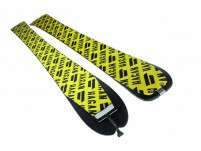 The updated version of the X-Race ski features ABS sidewalls for improved st..
“The Ultra is ultra awesome”, says Hagan. Since it’s an improved version of the awesome Cirrus, we’d have to agree. 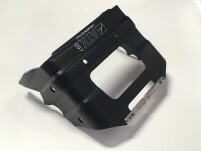 Hagan added mini ABS sidewalls to the Ultra for improved edge hold and durability. They also tweaked the shape to increase the effect edge ..
A dedicated touring ski tuned for kids finding their stride in the backcountry. Cut from the same cloth as Hagan’s big-human skis, the Ride Jr sports a proper weight, shape, and tune specifically for small humans. A lightweight Poplar core keeps weight do.. When preaching the benefits of lightweight race bindings to your side-country ski buddies, it’s best to avoid showing them your new Ultra binding. As minimalistic as they come, the Hagan pincers don’t instill a ton of confidence in suspicious-folk and you..
Hagan has a nice lineup of racing and touring bindings. It would be a shame to not ski them because you lost a toe piece. Buy a replacement toe and get back out there. Also you'll probably want some screws since you clearly forgot to mount your bindings t.. It's hard to argue with stronger and lighter. Comprised of an extremely lightweight alloy, ATK was quick to place themselves front and center in the eyes of the alpine touring crowd with a knockout ski crampon. Designed by Batman himself, this sinister lo..
Made for the Ultra bindings, these Hagan plates will give you 30mm for fore/aft heel adjustment, or approximately 4 mondo sizes. If you want to use a quiver of boots or increase the resale value of your rig, the adjustment plates are a good investment. Th..
Outfit your Hagan Z01 and Z02 bindings with brakes. Even the junior models. The brakes screw onto the heels and provide stopping power to the Hagan ski touring bindings. Don't lose your precious Sky Force or Ride Jr skis in an epic yard sale. Looking f..
Bindings are made of parts, it’s a fact. Some last forever, some need replacing. 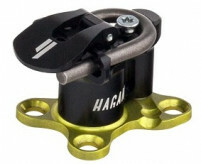 Find our collection of Hagan (ATK) binding parts below. Titanium Forks - Even with the fancy treatment on the titanium forks, they notch. At least they don’t cost an arm a..
Save yourself the effort of trimming skins by tricking out your Hagan skis with some functional and stylish precut climbing skins. These 65% mohair / 35% nylon blend skins offer a great combination of grip, glide, and durability while sporting unique colo..
What better way to proclaim your love for ski mountaineering than a T-shirt that flies under the radar? While not widely recognized in the U.S., Hagan is a great company that makes equipment for our beloved past time. 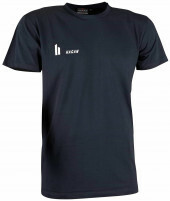 Their tee, emphatically named "The T-..